Recently, I made a video tour of my pantry. OK, I know that sounds a little strange. Allow me to explain. One of the modules in my Solve Your Dinner Dilemma virtual cooking class, covers how to stock a pantry, along with some life-saving pantry recipes. So the pantry video tour was to illustrate an example of a working pantry. Anyway, while I was filming, I started thinking how I really should use my freezer as an extension of my pantry. And that it would be great to show my students my freezer as well. On quick inspection, my freezer was looking like it had been banished to Siberia, rather than a wonderful source of last minute meals. So the freezer tour idea was promptly scrapped. Not long afterwards, I was contacted by Susan Austin, a friend of a fabulous friend who has written a cookbook called Frost Bite: Easy Cooking for Your Freezer. Would I be interested in having a look? Absolutely. So inspired by Susan’s inventive book, here are 8 ideas to save time using your freezer. 1. keep a stock of frozen vegetables. While fresh tends to be best from a taste perspective (apart from frozen peas), frozen veg can save valuable time. And lets face it, frozen vegetables are better for you than no veg. Chopped and ready to go, things like frozen broccoli, spinach, cauliflower and beans cook in about the same amount of time as fresh, but save valuable minutes in the prep area. 2. make sandwiches for lunches in advance. Susan’s book has a heap of suggestions for making school (or adult) sandwiches in bulk and freezing so in the mornings you just need to pull them out and they’re good to go. Filling suggestions include cooked meats, canned fish, cheese, pesto and more. 3. freeze cooked foods that will defrost in a lunchbox. If you’re bored with sandwiches, it doesn’t mean you can’t also take advantage of the freezer lunch idea. Especially great for dishes that can defrost during the morning and be eaten at room temperature. Lentil salads, fried rice, and meatballs are a few ideas to get you started. While having people over for brunch can be a wonderful way to catch up, who wants to get up super early to prepare a feast? I love Susan’s brunch chapter with recipes for cheat-day pancakes, corn breads, muffins, pastries and pies. 5. freeze fresh meat & fish prepared ready for the oven. Prepare your raw proteins with marinades, stuffings or herb crusts so they’re ready to bake or BBQ as soon as they’re defrosted. A great tip for stress-free entertaining. 6. freeze leftovers and small portions. I’ve avoided stating the obvious about the whole cook in bulk and freeze for later idea. Leftovers, however, are something that I rarely think to freeze. Perfect for small households who aren’t keen on eating leftovers the next day. 7. freeze cookie dough ready to bake. Next time I make a batch of these cookies, I’m going to be freezing what I don’t need for another day. Can’t wait. 8. freeze cooked desserts and cakes. The thing with baking is you tends to end up with more cake than needed, which can lead to over indulgence. Freezing for later is a brilliant way to avoid temptation and waste. Inspired by Susan Austin’s chickpea & roasted capsicum patties from ‘Frost Bite: Easy Cooking for Your Freezer’. Susan recommends cooking the chickpea patties and then freezing to reheat direct from frozen either in the oven or a fry pan. While I LOVE the flavours in these burgers, they are quite fragile, even with the egg to bind them. I’ve found it’s important not to over-process the chickpeas to help avoid your burgers falling apart in the pan. Just pulse until chopped. The good news is they still taste delicious if they do happen to fall apart. 1. Pulse chickpeas and cumin in a food processor for a few seconds or until roughly chopped. You don’t want a smooth puree here. 2. Crack egg into a small bowl and whisk lightly. Add egg and pulse again for a few seconds. 3. Fold capsicum into the chickpeas by hand so it keeps its shape. Season and using your hands, form into 2 burgers. Pop in the fridge for a few minutes. 4. Heat a small fry pan on a medium high heat. Add a little oil and cook burgers for around 3 minutes on each side or until golden. Being careful when turning so they don’t fall apart. 5. Meanwhile, stir yoghurt in a small bowl until smooth and season generously. 6. 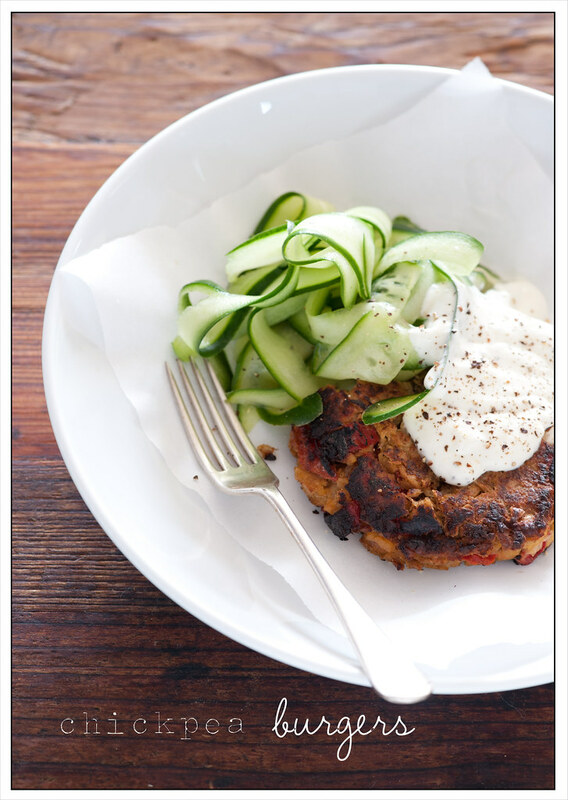 Serve burgers with yoghurt on top and cucumber salad (recipe below) on the side. My Irishman is allergic to cucumber, so I rarely use it. But I was looking for something different to a shaved zucchini salad to serve with the chickpea burgers and the cucumbers just jumped out at me. This salad will stay crunchy in the fridge for a few days but won’t go so well in the freezer. Feel free to add in some fresh coriander (cilantro) or parsley leaves for a bit more greenness. 1. Peel ribbons from the outside of the cucumbers, stopping when you get to the seeds. Discard seeds and place ribbons in a small bowl. 2. Season with salt and pepper then toss in lemon juice. Do you struggle to find time to fit cooking into your busy schedule? Then Solve Your Dinner Dilemma [fresh ideas] class is just the thing for you. Great tips! I’m definitely going to use my freezer for more than ice cubes and frozen pizza from now on (ehe..). After all, my freezer is taking up about half of my fridge space, so I should use it better! My best tip by far is to freeze cookie dough in portion sizes enough for one cookie. When you fancy a treat, you just put one in the oven. It will satisfy your sweet tooth, and help you keep your waistline! Those chickpea burgers look delicious, and your tips are great! Another one I use — have one huge “cooking day” and make ~10 freezable meals. That way, you can just reach in and get enchiladas/burgers/etc. for dinner. I agree. The chickpea burger recipe looks awesome and it’s very simple compared to other recipes I’ve seen. I’ll definitely give those a try this week. Also, I have been reducing my butter and oil intake lately by freezing chicken and vegetable stock in ice cube trays. That way if I need to saute a some veggies I throw a cube of the stock onto the skillet first instead of the butter or oil. Seems to work quite nicely. Thanks for the lunchbox ideas. I’m going to try freezing fried rice for my kids. I remember a friend’s mum kept a huge deep freeze in her kitchen. Once a month she would roast a turkey and a ham, then make sandwiches, wrap them in paper and freeze. At the moment my freezer is filled with veggie stock for soups, sliced bananas + berries for smoothies, and fresh tomatoes. I core the tomatoes before popping them in a freezer bag. When I need a tomato for a recipe, I take it out the freezer, run hot water over it for a moment and the peel comes right off. I’d love to be able to freeze more, but not sure what the best thing to use to store stuff in the freezer would be. Most times when I store stuff, it gets frost pretty bad. Recommendations? great ideas – i just love the efficiency of freezing pasta sauces, soups and stews. great post! i often wish my freezer was larger than the fridge portion – i use it more often! Best to use ziplock bags or other bags that are labelled ‘freezer safe’ not all plastic has the barrier properties to protect from freezer burn. I also love my pyrex containers which as also recommended for the freezer. We always have a couple of frozen AC Butchery sausages in the freezer for an emergency pasta sauce or sausage and tinned lentil bake. Frozen broad beans are surprisingly good (they must be, almost always sold out at the supermarket). Also, chicken stock, chicken carcasses to make the next batch of chicken stock, chillis, bacon, bay leaves. Tomatoes is inspired! The important thing is to be disciplined. If you didn’t love it the first time, freezing it is not going to make it much better! Oh, I should say I have made similar chickpea burgers and added a small can of tuna. Delicious and a little more protein. Sticks together well. You’ve just solved my evening meal dilema. I’m going away soon, so don’t want to buy any more food. The chickpeas were going to make hummus and then frozen, but now I’m going to make chickpea burgers with my first home grown cucumber. And I always cook more chickpeas than I need for hummus and either freeze the peas in cooking liquor or freeze batches of hummus. 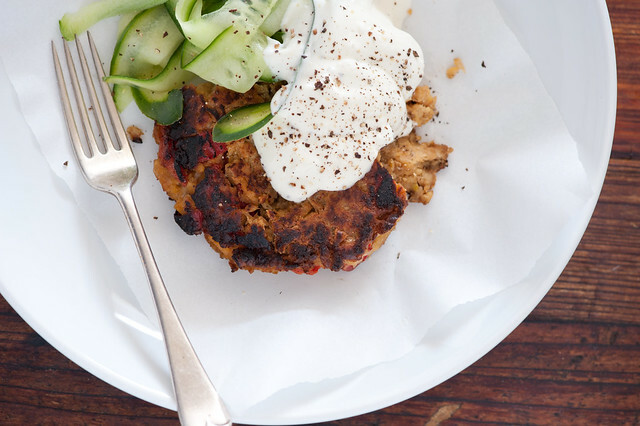 Tried tuna & chickpea burgers the other day… brilliant! So happy to help solve your dinner dilemma. When I bought my fridge, I specifically chose an ‘upside down’ one (freezer at the bottom) because they have a large freezer capacity. Each weekend I cook up my weekday lunches, and as many dinners as I can be bothered with. There is nothing like freshly cooked, but there is also a lot to be said for taking it easy on work nights! A great tip – my friend’s mother bakes a variety of desserts then slices them all into individual pieces, wraps each one foil and pops them in the freezer labelled some how. When it comes to dessert time everyone has a choice out of 3-4 different desserts. Easy to do and it makes that moment hillarious as everyone debates the merits of each taste wonder before deciding! Loved the chickpea burgers! Would it benefit with half the cumin and a teaspoon of garlic do you think? I found the flavours great but a bit too subtle for me. Many thanks for all you do! I’m working through a batch of your recipes and enjoying them! I use ground flaxseeds to stick my GF baked goods together… I bet if you added a teaspoon or two to the chickpea mixture, it would be pretty good! Can’t wait to try this recipe! Made this for dinner last night. Brilliant! I had good luck keeping the burgers together, I made four smaller ones instead of the two giant burgers. I was blown away by the cucumber and lemon salad, so easy and so tasty. I added a side of cold oil chips, which made the whole meal a hit with my picky teenage. Thanks for sharing.